In a time when children want it right now, rising 1st grader, Kennedy find that there are some things you simply can not rush. 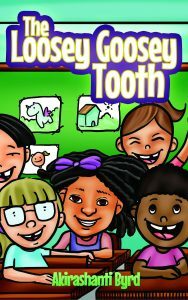 In Loosey Goosey Tooth, Kennedy is faced with two of life’s many lessons: learning patience and having self-control. Kennedy’s journey begin as she is the last classmate to loose her first tooth. Kennedy had to learn that even though everyone else was losing their teeth, it simply wasn’t her time. Impatient to lose her tooth she tries many different ways that sadly she learned they were not the best way to become snaggled-tooth. As Kennedy’s journey continues, she realizes that when her tooth shakes and shiggles, giggles and wiggles, it is ready to come out, it’s loosey goosey! Your child will become Kennedy’s classmate and learn how she copes with her snaggle tooth problem. The beautiful, motivational words of Kennedy’s mom will explain that certain things only happen when the time is right. Akirashanti Byrd, the owner of CurlCentric.com, was born in 1977 in Brooklyn, New York and grew up in Birmingham, Alabama. She became interested in natural hair in 2005 when she had her first experience with mental transitioning with her daughter during a time before the online natural hair community was available. Shortly after, in 2007, deciding to be a living example for her daughter, she received her last relaxer. In 2011, Akirashanti began blogging about natural hair to provide education, encouragement and excitement to natural hair fundamentals. Curly Kids Coloring Book is Akirashanti’s first published book. She enjoys blogging about natural hair and journaling about her experience with personal development as much change and growth has happen since she first began.